HHHunt Homes is thrilled to announce the opening of our magnificent, state-of-the-art Design Gallery in Newport News, Virginia! We’re proud to offer the incredible benefit of one stop shopping in a convenient and beautiful environment to our homebuyers in the Hampton Roads area. 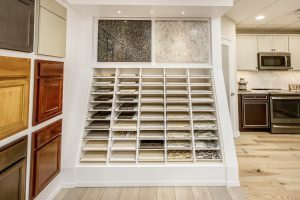 On-trend flooring selections for enhancing your home design. Wide variety of lighting choices that bring out the best in your beautiful interior design. High-quality fixtures to accentuate the look of your bathrooms and kitchen. Beautiful cabinetry and modern appliances to transform your kitchen into the heart of the home. The easy and fun process of choosing high-quality products doesn’t just take out the stress and guess work, but also offers comfort, convenience, and efficiency. You’ll have more time to look forward to your future home that elevates your lifestyle and provides a peace of mind! After purchasing a new construction home with HHHunt Homes, we invite you to relax and enjoy a world-class experience of personalizing your new home with our experts guiding you every step of the way at the Design Gallery in Newport News.